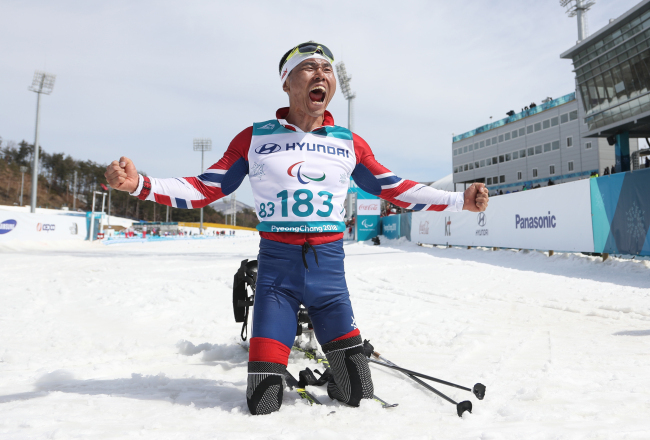 Para Nordic skier Sin Eui-hyun earned South Korea's first gold at a Winter Paralympic Games after winning the men's cross-country skiing event at PyeongChang 2018 on Saturday. Shin finished first among 34 contestants at Alpensia Biathlon Centre in PyeongChang, Gangwon Province, with a time of 22 minutes, 28.40 seconds to take the gold medal in the men's 7.5-kilometer sitting cross-country skiing event. This is the first time that South Korea took gold at the Winter Paralympic Games since the country made its debut at Albertville 1992. Before Shin's gold, South Korea won two silvers and one bronze. It's also Shin's second medal at the PyeongChang Winter Paralympic Games. He previously won bronze in the men's 15km sitting cross-country skiing last Sunday.